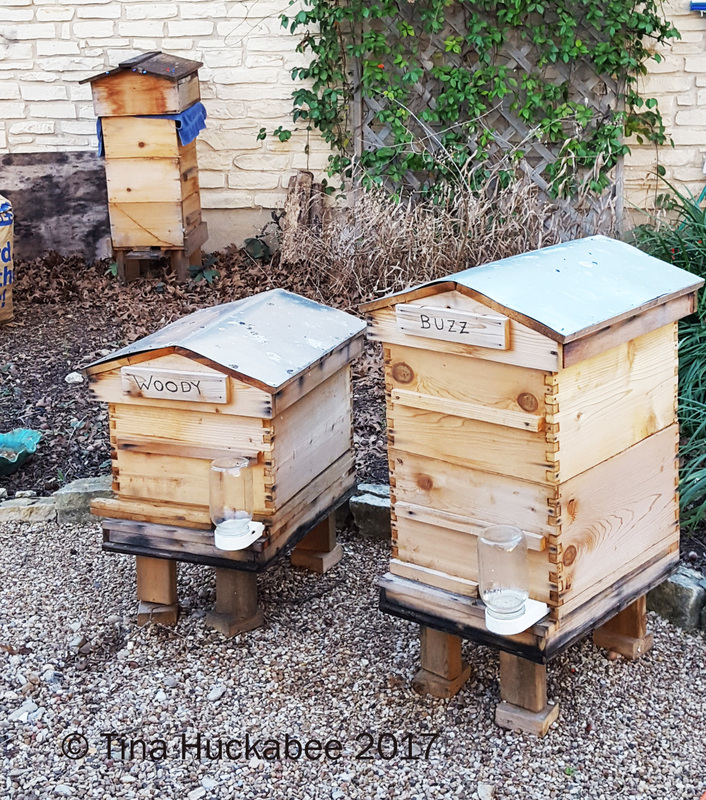 We’re ramping up for spring and another (hopefully) successful year of honeybee keeping with our two newer hives, Buzz and Woody, and the remaining original hive, Scar. Woody and Buzz, the Langstroth hives, are in the foreground and Scar, the Warre hive, resides in the background. 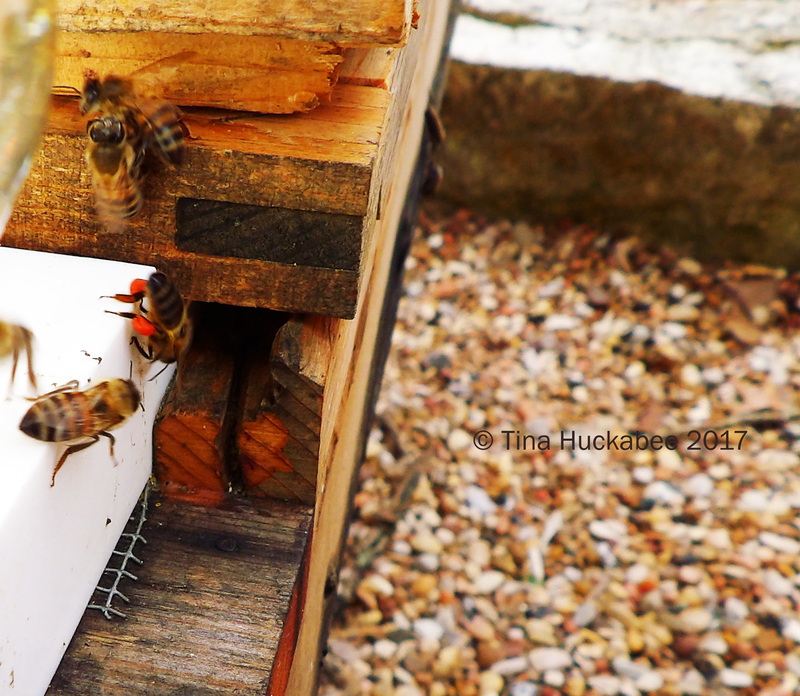 Fresh from a day-long beekeeping seminar that we attended a few weeks back and armed with loads of new and refreshed honeybee information, we’ve been eager to check out our hives and see how the girls fared over winter. Though it feels a little early in the season, it’s been a mild winter with the exception of a few days in the 20s F (-6ish C) in December and early January. Our original plan for a first hive check was to test for varroa mites, but it’s either proven too cold (below 65 F /18.3 C) or, as it was this past Sunday, above 65 F, though too humid. Varroa mites are a serious threat to honeybees and unfortunately most commercial and hobbyist bee hives have some varroa mite levels. The trick is to keep tabs on the mite levels so that they don’t overwhelm a hive and subject the bees to fatal viral overloads. Truthfully, Bee Daddy and I haven’t been particularly good about keeping a regular check on varroa mites; in fact, we’ve been downright irresponsible about checking for varroa mites. Partly that’s because we’ve hived honeybees who enjoy a proven resistance to varroa mites (thank you, BeeWeaver! ), and partly because…we just haven’t. I’ve seen mites on larvae a few times when I’ve pulled off comb and last year we lost a hive, Mufasa, to a fatal viral load, most likely due to a varroa infestation. You can read about that sad event here. This year, our 2017 bee keepers’ resolution is to be better bee keepers and we will check for varroa at least four times over the course of the season. 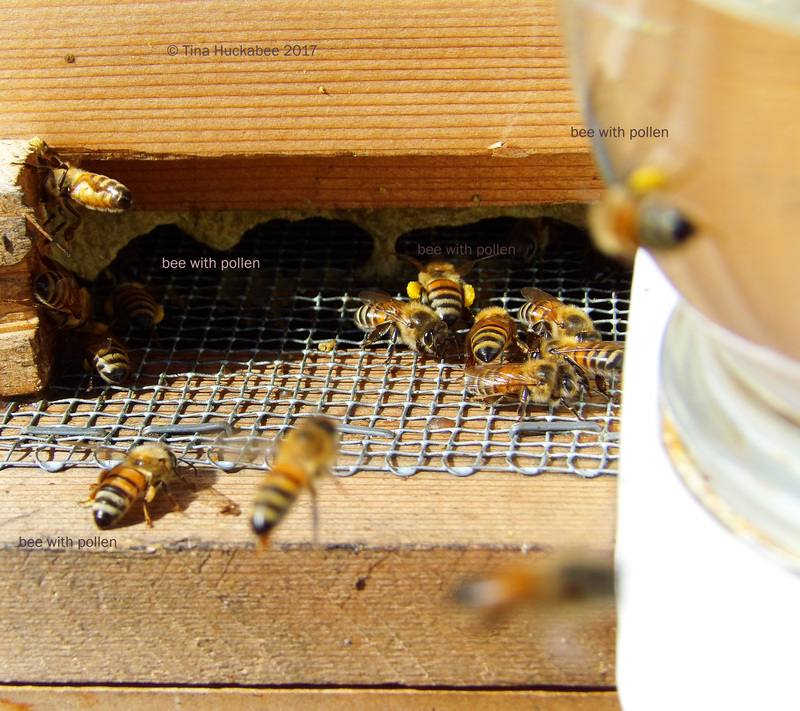 It was good to see what was going on in our honeybee hives after so many months. This frame has comb and nectar, but little else. I’m enamored with the salmon-red pollen; I have no idea which plant produces it, but wow! The bees have also been bringing in lots of creamy white pollen, much of which I suspect comes from a neighbor’s stand of viburnum. Creamy white pollen taken from the flowers and stored in the corbiculae, pollen baskets, or pollen pantaloons. As always, lots of good, old-fashioned yellow pollen is collected–no doubt from a variety of sources. Can you count the number of bees carrying pollen? I counted five! 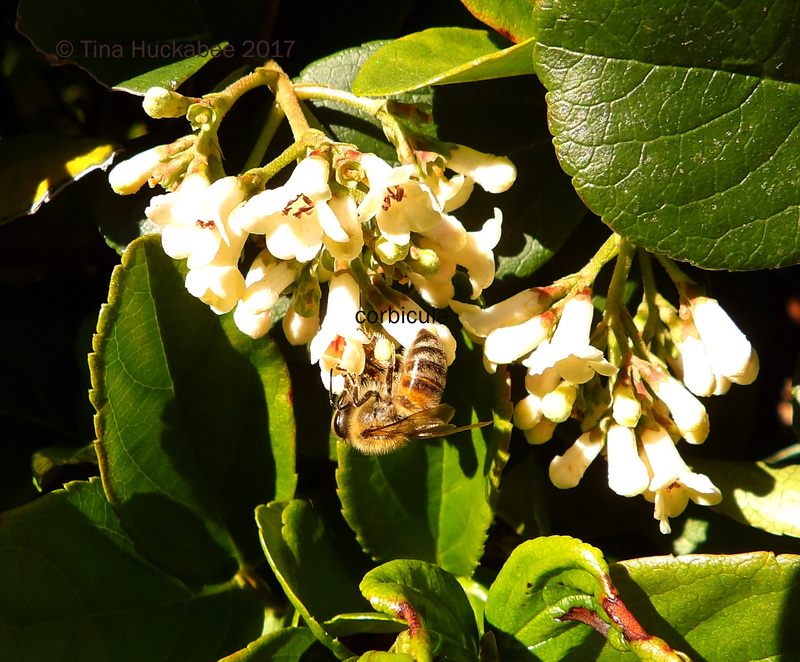 Honeybees forage up to three miles and I know that viburnum, rosemary, flowering quince and perhaps a few early trees are in flowering mode. My Leatherleaf Mahonia, Mahonia bealei, was certainly one source of nectar and pollen a few weeks ago, but there’s nothing currently blooming in my garden that the honeybees are interested in, though I have seen a few of the tiny wild bees working at some native salvia species that have pushed out some blooms in the last week or so. Honeybees forage for nectar, which is their carbohydrate source, and pollen, which serves as protein. A diverse and well-rounded diet is key to a healthy life and honeybees certainly benefit from a diversity of flowers. 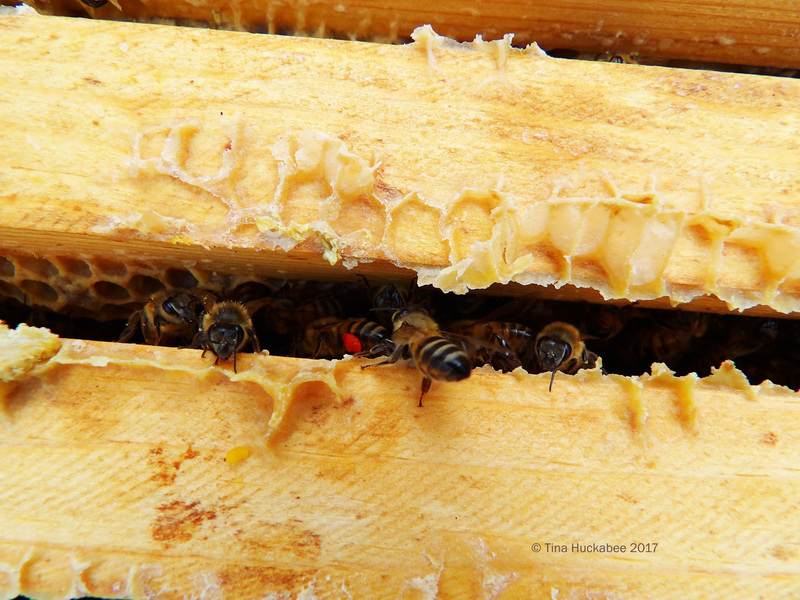 That the honeys are pulling in pollen and nectar from a variety of early sources is a good thing. 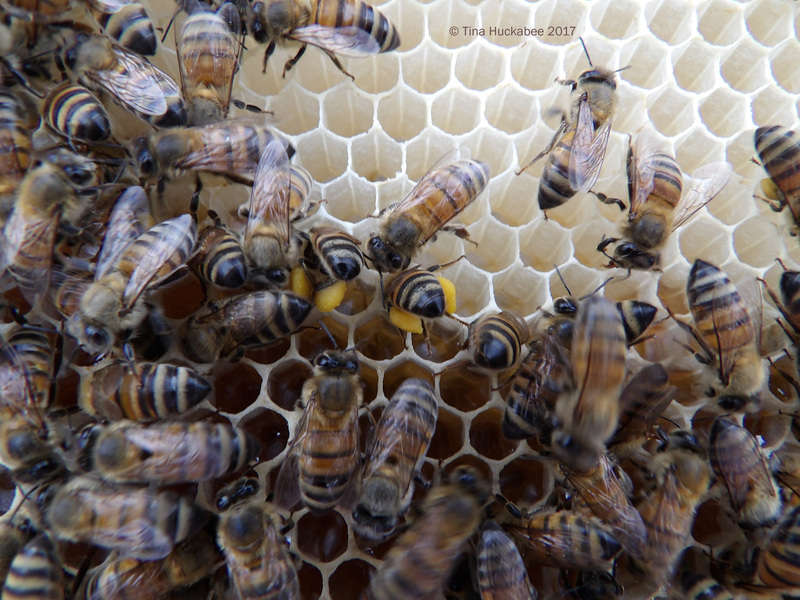 I planned to take a photo of the comb with differing pollen colors, but completely forgot about that once I was in the hive and looking at the good work of the queen, with support from her workers. 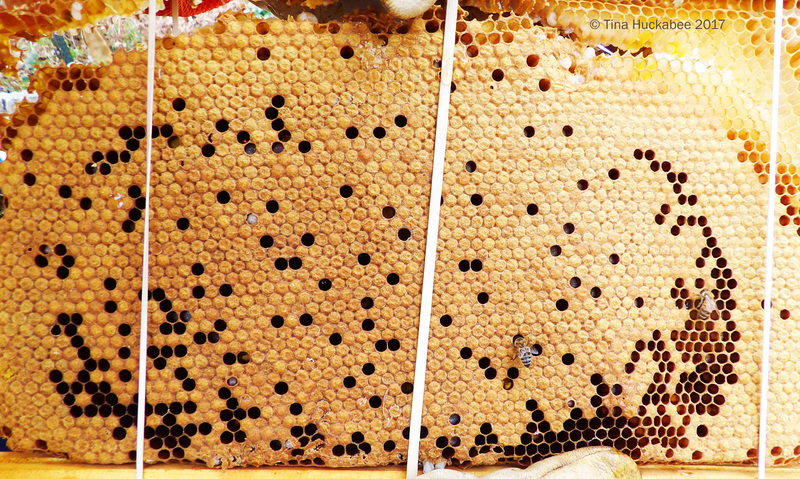 This comb–and it wasn’t the only one–demonstrates a beautiful pattern of capped brood, meaning that Buzz’s queen is healthy and laying eggs. 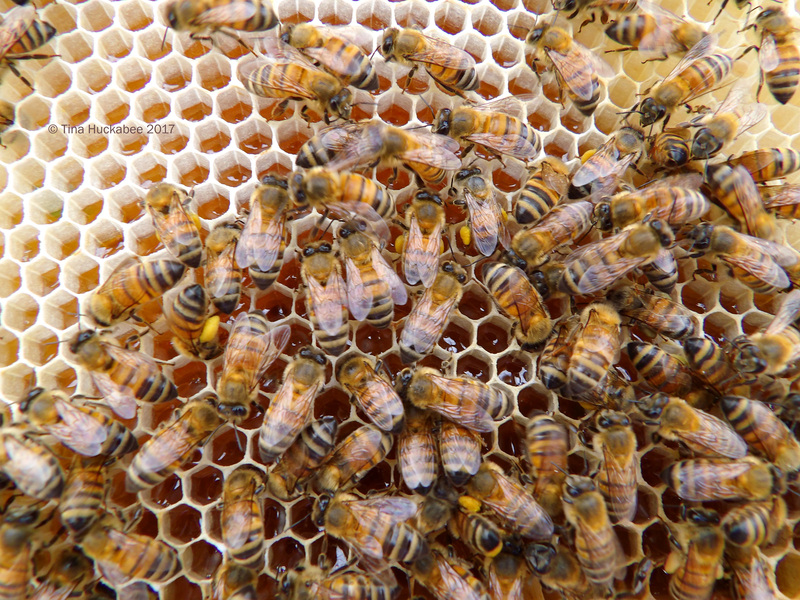 The next generation of honeybees is in the works! While pulling up some frames to check, I tipped one full-of-comb frame and the comb broke. ARGH! It’s not the first time I’ve made that mistake (when will I learn? ), but when I’ve done that in Mufasa or Scar–the Warre hives, with top bars and not frames–we had to sacrifice the comb, or if it was full of honey, take the honey. 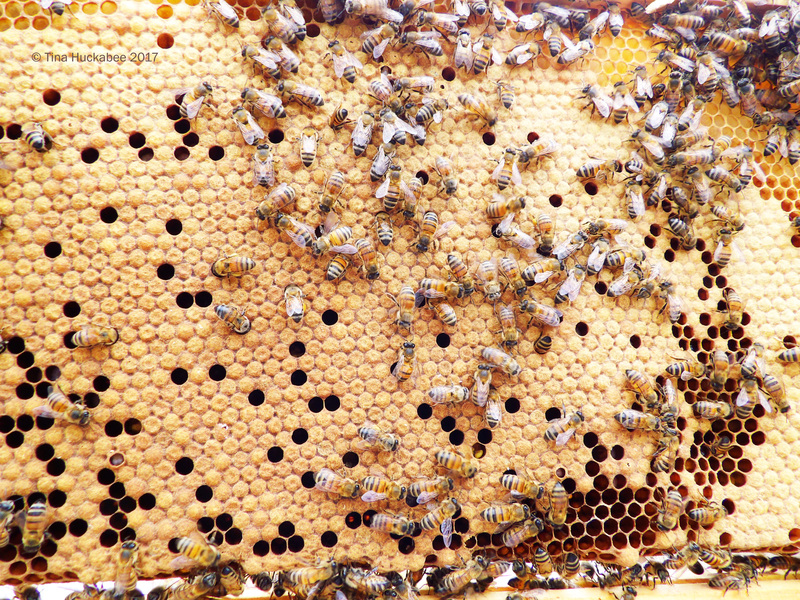 There is simply no remedy for placing a broken comb attached to a bar back into the hive, because there is no way to “hold” the comb in place. Now that we use Langstroth hives with full frames, a dumb mistake is fixable. 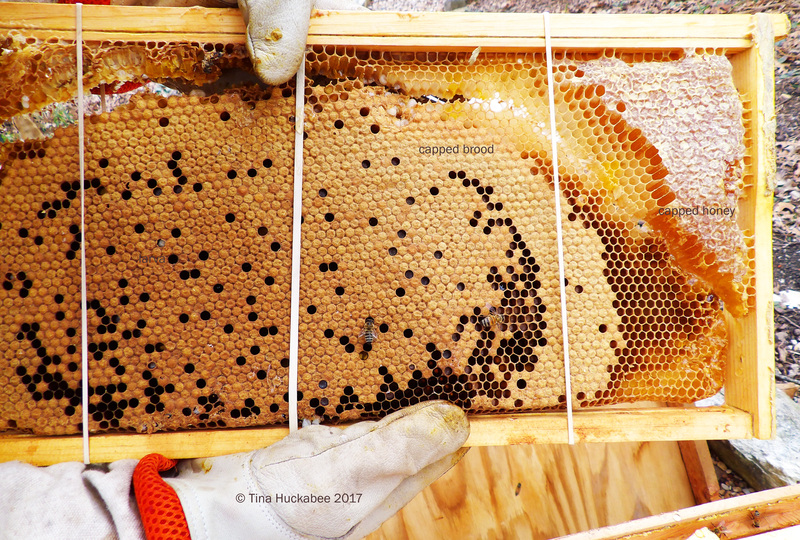 This frame is mostly capped brood, but there are some uncapped brood (larvae) and there is also some honey in the top right corner. 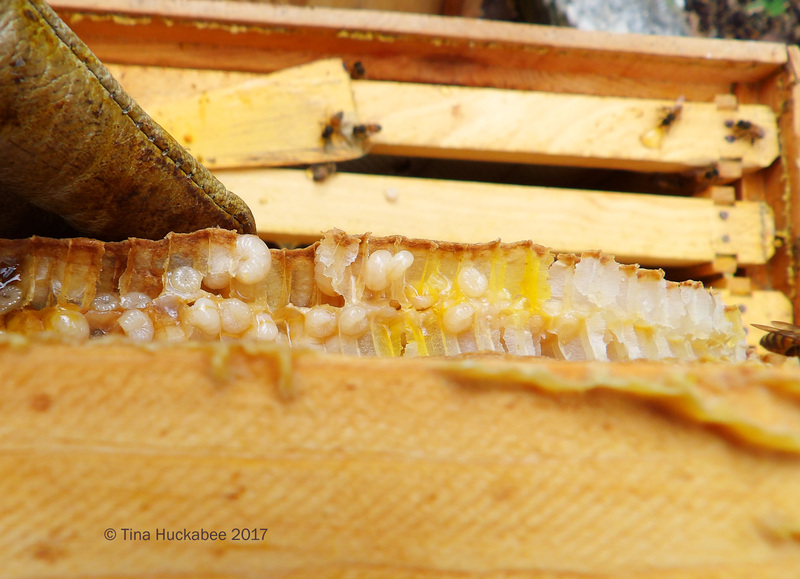 Three rubber-bands wrapped around the girth of the frame will sufficiently hold the comb in place and allow industrious little bees to repair the beekeeper damage by building new comb and continuing their honey-making or baby-bee tending. Unfortunately, some of the larvae about half-way through their development were victims of the comb breakage. 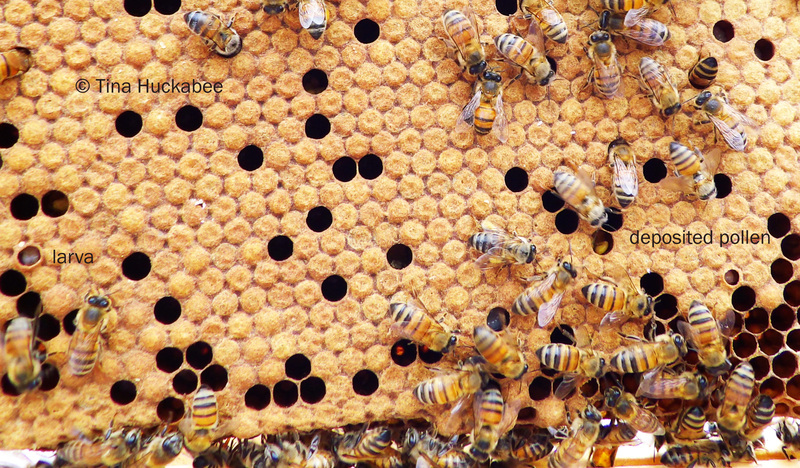 The bees will harvest the doomed larvae as a protein source–bees waste nothing. Once they’ve rebuilt the comb, Ms.Queen will probably lay more eggs in the new comb. Ramping up indeed! I was pleased to see that Woody and Buzz seem healthy and next time we open up the hives, we plan to conduct our first varroa mite check for the season. Sadly, Scar is on her way out as a viable hive. 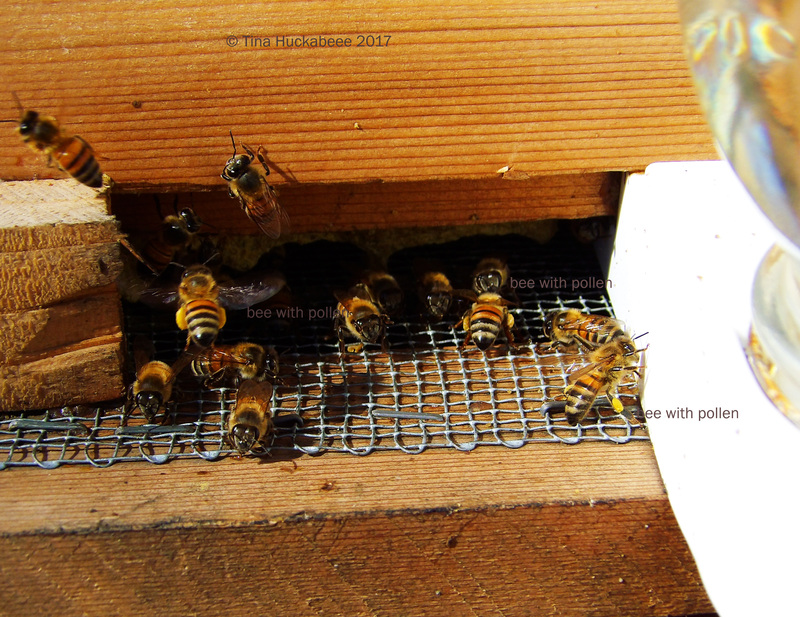 There were five full combs of honey in the top box–we took three out–but the lower boxes contained mostly empty comb. There is no brood, indicating that the queen has probably died and while there are worker bees busily foraging and still engaging in most of their bee work, there’s no new generation to nurture. 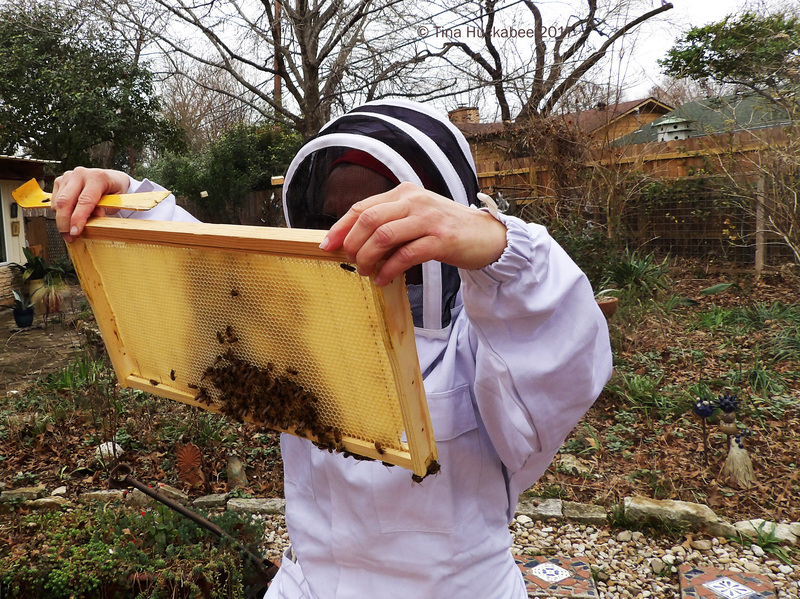 Last year, we decided that once our Langstroth hives (Buzz and Woody) were up and buzzing, we’d allow Scar to atrophy naturally–there would be no extreme measures to keep her going. Still, I’m a little sad and must admit to a temptation to re-queen her. But Scar is a difficult hive to maintain and I’ve become quite spoiled at the ease of working with Buzz and Woody in all their Langstroth glory, so I imagine I’ll keep with the original plan and let Scar go. Scar’s bees will live out the rest of their lives over the next month or so and then she will be empty. I’ll plant something bee-friendly in that shady spot in Scar’s memory: maybe a nice Evergreen sumac, Rhus virens or Turk’s cap, Malvaviscus arboreus. 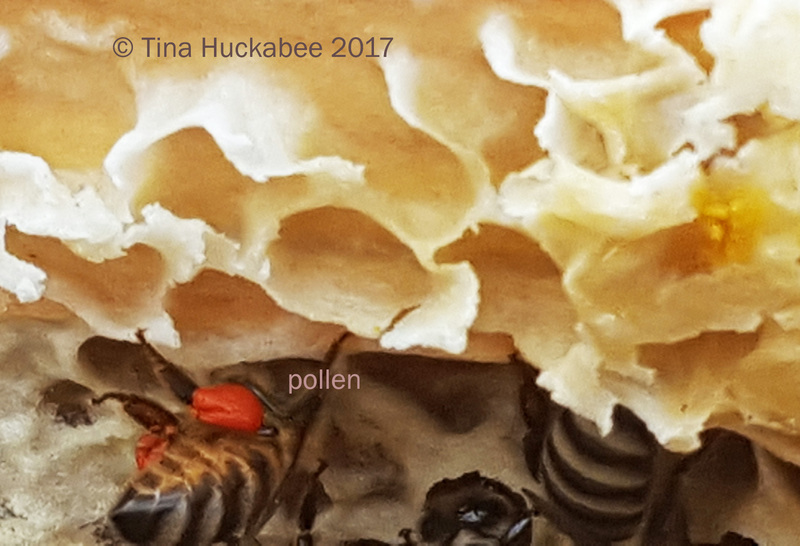 This entry was posted in Backyard bee keeping, Bee keeping, Honeybees, Uncategorized and tagged Langstroth bee hives, Warre bee hives by Tina. Bookmark the permalink. A very interesting post! I still have lots of bees feeding from my hummingbird feeders. Hopefully, more flowers will start blooming around here soon. Thanks–they like like sugar water. I’ve fed mine the whole of winter, just to make sure they had enough. Wonderful update Tina. Such informative, clear photos. Love the spectacular coloured pollen (I’ve seen blue too, but can’t remember what it was from). Oooh, blue pollen–that must be something to see. I suspect the pollen is from the flowering quince, but haven’t had the time to look closely at their blooms to see if that’s what the bees are collecting. Ah, just looked that up. Pretty! Blue pollen. Wow! Intersting post Tina, is that you with a kit on but no gloves? You must be very relaxed! Wow, thanks for the insider view of your hives! Very fascinating! It’s funny, I was watching I show tonight about beekeeping. At one point, the beekeeper stood right in the middle of a swarm of honeybees, wearing shorts and a T-shirt and no protective gear! I realize the bees were busy and not interested in him, but still it seems so dangerous. I enjoy having honeybees (and native bees!) around me, but like you, if I were a beekeeper I would make sure to wear protective gear. Great post! Great photos! Thanks, Beth! Bees are super interesting, aren’t they? While swarming looks scary, it’s actually when honeybees are at their most docile–they have no brood, honey or home to protect. But yeah, having a pulsating, live, buzzing mass of individuals–all with the capability of delivering a powerful “punch” is intimidating. Tina a very interesting article accompanied by wonderful photos to explain everything. I have learned a lot from Beekeeping thanks to you, Mama Bee. The interior of a beehive is a beautiful and very interesting place. Pollen of different colors could never imagine it. Thank you very much, it’s an unforgettable post. Greetings from Margarita. 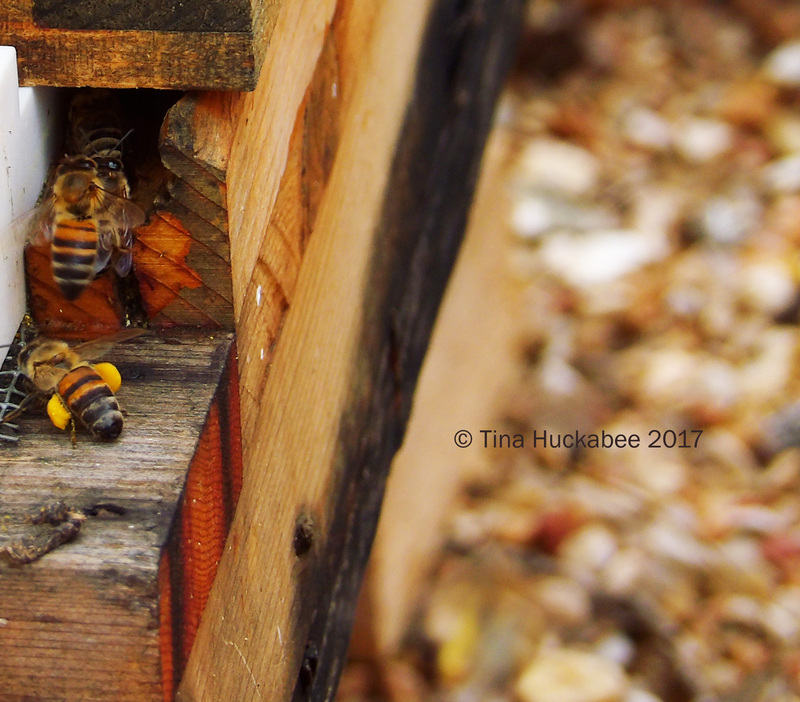 Honeybees are interesting and there’s so much to learn about them–I’m pleased that you enjoyed the post! I had no idea that pollen comes in anything but yellow. Well, and greenish-yellow, which happens to be pine, and which is beginning to collect on my car and in my varnish now. I’ve never known anyone with bees, and I really haven’t known anything about bee-keeping. For that matter, I went for decades knowing only bumble bees and honey bees. Then, I learned about sweat bees, but that was it. There are people at our farmers’ market who sell local honey and beeswax products, and I know there are societies around, but I found the details and photos here fascinating. Not only that, by the time you got done telling the tale of Scar, I was ready to shed a tear. I had no idea that hives were named. I suppose it is easier than naming each individual bee! Pollen colors come in quite a variety. I’ll try to get a photo this spring of the comb with the pollen mosaic. It’s remarkable just how many native bees there are. I didn’t realize the scope of native bees until I began reading and paying attention to what’s in my own garden. When we first hived, we didn’t name the hives, but we would keep records and naming each hive was easier than writing, “left hive” or “right hive.” Thus, Scar and Mufasa and now, Woody and Buzz.